If the Creeds of the Christian Church aren’t infallible (being without the possibility of error), then why on earth would we use them? “I just believe the Bible” is no defense against cults, superstitions, apostasy, and heresy, since nearly every sect for the last two thousand years has claimed the Bible for support. The answer is not to make the church’s teachers infallible interpreters of Scripture. Nor to ignore the church’s teachers, but to have the humility to recognize that “iron sharpens iron” and that it takes the wisdom and insight of many interpreters over many centuries to help us to see our blind spots. Only a fool would ignore the accumulated wisdom of nearly twenty centuries. Visit the Core Christianity website to learn more! Writing in the New Yorker, James Wood offers us an interesting take on the contemporary place that the Book of Common Prayer has in our society. The words persist, but the belief they vouchsafe has long gone. A loss, one supposes—and yet, paradoxically, the words are, in the absence of belief, as richly usable as they were three hundred and fifty years ago. All at once, it seems, they are full and empty. They comfort, disappoint, haunt, irritate, disappear, linger. The whole piece is worth a read here but it got me thinking about the ways that the Psalter (the 150 Psalms) are similarly looked upon in our contemporary culture. Certain phrases and snippets are printed onto mugs or used in funerals or on condolence cards but our neighbours (Canadian society more broadly) have largely left behind the beliefs which undergird and enliven the Psalms. As with the Book of Common Prayer and the King James Bible, the Psalter in particular has had a profound impact on the literary and artistic culture that we have inherited. Nevertheless, it is increasingly a foreign and off-putting text which is, in the memorable phrase of James Wood, “full and empty”. When we faith-full-y sing the Psalms in public worship and read the Psalms together, we are brought into a liturgy of sanctification that transforms us. While our congregation has never made use of the Book of Common Prayer in a formal manner - and many would be quite unfamiliar with it - the theological content and the manner of expressing our heartfelt repentance for sin, our profound awareness of God’s glory and majesty, and our faithful reception of the mercies of God shown to us in Jesus Christ all find beautiful expression in the phrases and responses of the Book of Common Prayer. And the BCP derives much of its scriptural basis from the 150 Psalms. And where the Word is present, the Lord’s work is continued in us! Where's your head at when you sing the Psalms? Bradley Johnston, in his book "150 Questions about the Psalter", asks a great question for us to consider together as we worship the Lord and draw upon the wondrous resources found in the Psalms. I don’t know about you but I certainly can attest to the fact that it can be a challenge to adopt this proper mindset while singing the psalms or even in the time leading up to our singing. It’s easy to be distracted (even by the mechanics of singing!) and we can lose sight of the great wonder of bringing our songs before the very throne of God in praise of His Holy and Glorious Name! May the Lord bless you as you sing! What happens when you sing the Psalms? The Psalter moves our attention in a variety of directions as we sing. We know intuitively that we generally have a lot on our minds during each day. Nonetheless, in the singing of the psalms our attention is spiritually refocused on these wonderful realities that we are participants in! Lift your voices and be renewed in your hearts and minds through the praise of His Holy Name! A great read by Adriel Sanchez over at Core Christianity about a topic that resonates with any Vancouver or Metro Vancouver resident wrestling with the dynamics of change in our neighbourhoods and the inflow/outflow of folks in our neighbourhoods. By the blessing of the upright a city is exalted, but by the mouth of the wicked it is overthrown. Whoever belittles his neighbor lacks sense, but a man of understanding remains silent. "Christ's global garden grows in local plots"
"One example of the tendency to shift our focus from the ministry to the ministers, I believe, is the proliferation of multi-site churches. I am not in any way suggesting that those who favor a multi-site model of ministry are guilty of reckless ambition. I take it for granted that they are motivated by mission and would agree heartily with much else that I’ve argued here. My concern, however, is that the model is more susceptible to a greater focus on the minister than on the ministry. Regardless of intentions, the medium ensures that he can never be the pastor, but only a celebrity teacher. By being the “pastor” of many churches, he is actually the pastor of none. Furthermore, it is his board that has the last word. This model seems far more hierarchical than the others it rebelled against. Christ’s global garden grows concretely only in local plots." How should the majesty and ancient authority of the Psalter shape our services? Bradley Johnston, in his book "150 Questions about the Psalter", quotes from William Binnie to answer the question posed in our title. How should the majesty and ancient authority of the Psalter mold worship services? "In the Church of Jesus Christ, where the prayers are free, it is of utmost importance that services of worship should be molded in the forms of ancient authority; and surely the best possible mold is that which the Holy Spirit Himself gave by the Psalmists, which has left its divinely guided lines on the Church for these three thousand years." I'm struck by that phrase, "divinely guided lines", and the compelling suggestion that this is the mold that we are to see impressed upon our services of divine worship. As I continue to grow in my understanding of and appreciation for the Psalms, I'm amazed at the ways in which the indelible mark of the Holy Spirit's inspiration becomes more and more evident in these sacred compositions. What do we currently have in our repertoire that bears the majesty and ancient authority of Holy Scripture? The letters to the churches in Revelation feature the refrain “He who has an ear, let him hear what the Spirit says to the churches” (Rev 3:22). This is no accident. The apostle Paul, writing to Timothy, explains “ the Lord stood by me and strengthened me, so that through me the message might be fully proclaimed and all the Gentiles might hear it” (2Ti 4:17). The congregation called by the voice of God gathers in expectancy, waiting for the sight of Christ to be revealed to them as they hear the shout of the archangel and the blast of a trumpet (1 Thess 4:15-17) on the Last Day. Until that day, the Christian church is defined by the way in which it is to receive the Word: audibly through the preaching of the Word (Rom 10) and visibly/tangibly in the administration of the sacraments. The ornamentation of the preached Word rests on the communion table that sits in the front of the House of God. The visual enhancement of the preached Word is contained in the cup and the bread in this period of waiting for the return of Christ (Acts 1:11). The adornment of the preached Word is the fruit it bears in the hearts and lives of believers in all stages of Christian maturity. I've included an excerpt from the interview in order to whet your appetite for this excellent book that we'd highly recommend to you! I (Pastor Norm) have used it as a teaching resource for a course on covenant theology and it was great to see the reception it received among lay-readers! You can buy a copy through Reformed Fellowship. MR: How will this book impact the way lay Christians read the Bible devotionally? 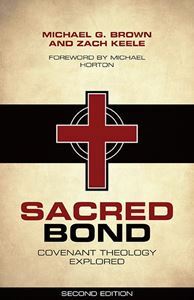 MB: Our prayer is that reading Sacred Bond will help you know how to read and interpret the Bible more faithfully. Studying God’s covenants has one primary goal: to know God and our relationship with him more fully. Studying the covenants should never be a dry academic exercise. It has immense pastoral and practical value for the Christian. It revolutionizes our approach to Scripture, providing us with helpful categories to understand the relationship between the Old and New Testaments. It shows us that the Bible is actually one book with one story, told on the stage of real human history. It highlights the plotline and central point of Scripture, setting every story in the context of the larger story about Christ. More importantly, it comforts us as we learn that God accepts us not on the basis of our covenant faithfulness but on the basis of Christ’s. It sweetens our fellowship with the Father as we come to know his oath and promises to us, promises that are “yes” and “amen” through the Mediator of the new covenant. It changes our view of the local church as we discover that we are part of God’s covenant community and worship him in a covenant-renewal ceremony every Lord’s Day. It transforms the way we see our children—namely, as the baptized members of God’s covenant of grace. It helps us understand that covenant is not a means to an end, but it is the end itself—the communion between God and his people.